A strong fight back from Shillong Lajong FC could not prevent them from going down 2-1 to Hero I-League 2016-17 table toppers East Bengal at the JN Stadium here on Saturday. In what was such a crucial match, Lajong’s defence made a couple of mistakes in the first half, which saw the visitors take a two-goal lead. However, a stronger second half showing resulted in Aser Dipanda Dicka grabbing a goal back, but the Kolkata club held on for the victory that keeps them at the top of the table. Lajong stay in fourth place on 16 points. It started well for the home team with a neat move by Bipin Singh up the left flank in only the second minute but Fabio Pena failed to meet his excellent cross. The Lajong Faithfuls were left thoroughly gutted when in just the eighth minute Christopher Payne easily tapped in the ball for the opener after Vishal Kaith had come forward to try and block. Out of position, he had no chance to get back to keep the ball out. In the 33rd minute East Bengal earned a free-kick halfway up Lajong’s side of the pitch and the ball was curled in towards the huddle of players. The Reds failed to adequately mark Payne and the Australian was able to slot the ball into the corner of the net for a two-goal lead. Despite these disappointments, there was plenty to show that Lajong have a strong team in place, with excellent spells of passing and moves forward, especially on the flanks, which Bipin made his own. The table toppers did have a good look early in the second half when Robin Singh and Payne combined well up front, but the Australian’s attempt from a tight angle went wide of the far post, denying him his hat-trick. Other than this, it was pretty much Shillong Lajong’s half, with Dicka getting his ninth goal of the season in the 64th minute following a perfect cross from Samuel Shadap on the right flank, which was welcomed by a tremendous roar from the Faithfuls. The Cameroonian forward was in relatively open space and headed the ball into the net past opposition keeper Rehenesh TP. For his consistent efforts up front Dicka was named Hero of the Match. The striker almost got his brace, and the equaliser, 10 minutes later, but a high bounce proved hard to negotiate and the attack then fizzled out with East Bengal’s defence proving to be nothing if not resolute. A little earlier Samuel Lalmuanpuia had tested Rehenesh to the latter’s limit, with the custodian having to make a full leap into the air to keep out the No. 9’s long distance scorcher. 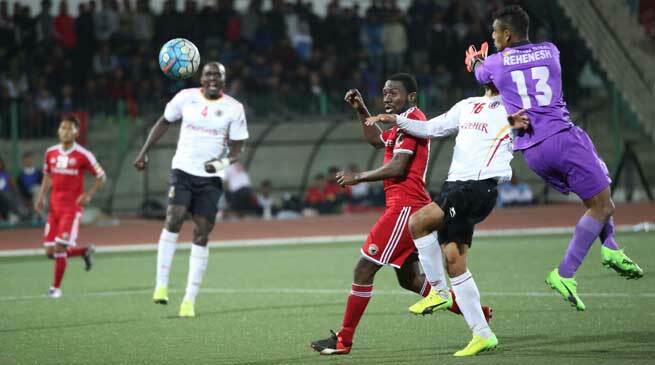 Towards the end of the match, Vishal made up for that first goal concession by making an excellent diving save to the right, but substitute Rupert Nongrum, who came on for Fabio, scuffed a decent chance in the dying minutes. Despite the disappointing loss, coach Thangboi Singto was pleased to see his charges fight it out right to the final whistle, but Lajong will have to perform consistently well over the entire 90 minutes in their next match, which is away to Minerva Punjab FC on 7th March.